The post title is not correct, of course. What I'm trying to say is that KL is back to normal after the Bersih rally on Saturday. Look, no more rally, ma.. 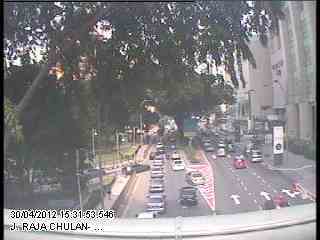 The above is a video-grab from a city traffic monitoring CCTV showing the traffic situation downtown in Jalan Raja Chulan near Pavilion, the shopping mall. Everything is back to normal, the streets all cleaned up and Kuala Lumpur is just like nothing had happened. Aren't we Malaysians just so cool?! We now wait for the elections. Again, have you registered to vote? If you were wondering as to why there was no update here on the Bersih 3.0 rally yesterday, I was out of town. You may even say I missed the action. I expected a peaceful sit-in rally but it was not to be from what I read. 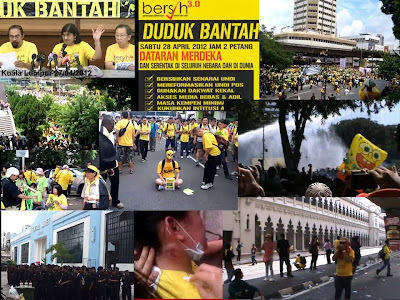 Dataran Merdeka was declared out of bounds to the public for 72 hours, from Friday morning, ahead of the planned Bersih 3.0 rally Saturday afternoon. A magistrate's court order was issued Thursday night. The court order was being displayed on an electronic billboard at Dataran Merdeka. Other areas covered under the court order include Jalan Sultan Hishamuddin, Jalan Raja and Jalan Kelab. The court order bars organisers of Bersih 3.0 and people from gathering at the historic square. The organisers say they will abide by the court order but insist the gathering will go on as planned. 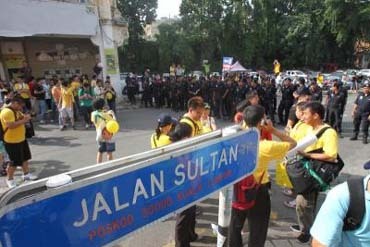 Bersih co-chairman Ambiga had said on Friday that they would respect the court order and remain outside Dataran. Himpunan Hijau, an anti-Lynas group, has also stated its intention to hold a rally, protesting the setting up of a rare earth processing plant in Gebeng, Pahang. 7.50am: Very heavy police presence at the entrance of KLCC, Jalan Ampang. No sign of any demonstrators. 7.57am: A small crowd of Himpunan Hijau protestors can be seen at the KLCC park. 8.20am: Two lorry selling food and tidbits parked at Masjid Negara for those who want to grab a quick breakfast. A sign says Masjid Negara is closed to non-Muslim tourists Saturday. On normal circumstances, the mosque is open from 9am to 12pm from Monday to Sunday. 8.30am: Police have blocked entry into the city via Jln Syed Putra; both from Federal Highway and Jalan Klang Lama. Jam building up on Federal Highway. KL Sentral bustling with people going about with their daily activities, unperturbed with the expected gathering of Bersih 3.0 supporters at nearby Jalan Brickfields. The large crowd can be attributed to the fact that it is a long weekend with Tuesday being Workers Day. Many were seen carrying bags to make their way back to their hometowns or holiday destinations. No Bersih supporters have gathered at Jalan Brickfields. Calm atmosphere at Central Market, with pockets of supporters wearing yellow T-shirts all around the area. Police presence not heavy with only a group of Rela members and several police officers around. No police trucks in the area. Himpunan Hijau stages a brief sit-down at the KLC park entrance, shouting anti-Lynas slogans. Kelana Jaya LRT service running smoothly amidst conflicting claims and reports of service disruption, including the alleged closure of the Kelana Jaya station. Heavy police presence at Sogo; Jalan TAR at Sogo, leading to Dataran has been sealed off. At least 100 uniformed policemen here. 8.45am: Police starting to gather at Central Market. Calm atmosphere at Masjid Negara. Supporters are sitting around, chatting amongst them. A supporter tells reporters more are on the way. 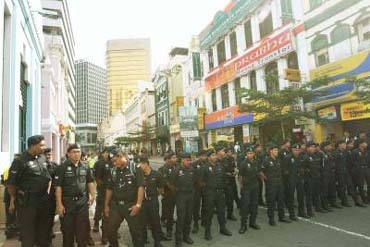 8.50am: Increased police presence at the KLCC's Jalan Ampang. There are eleven trucks parked with about 500 policemen. Some of them are carrying food and water out of the trucks. A few yellow shirts are seen around Sogo. 8.50am: A group of Bersih 3.0 supporters have assembled in front of the Pasar Seni LRT station, talking with passers-by. Only a handful of police officers were so far seen patrolling the area. Another crowd of supporters have gradually gathered in front of main entrance of Jalan Raja at the police barricade. Dressed in yellow shirts and bandanas, they occassionally chant reformasi, among others. 8.51am: Traffic has started to build up on some roads leading towards the city centre, where Dataran Merdeka is. The Federal Highway has been congested from the Mid Valley intersection up to the Putra University station from 8am as motorists encounter road blocks, which were set up around the Dataran Merdeka at midnight. Other major roads in the city relatively clear. 8.59am: Police have set up a strong presence at Central Market, with easily over 150 officers split into several groups stationed around the premises. A police helicopter hovers over the area in an otherwise peaceful morning. 9am: A crowd in yellow t-shirts have gathered here. Volunteers are selling yellow "Angry Birds" balloons to the public. Written on the balloons are "Clean Elections" "Stop Lynas" "Bersih 428" and "Save Our Children". They are selling the balloons with a yellow recycled bag and a towel for RM20. Police personnel standing in rows at the blockade at Sogo, forming a human barrier to stop any from passing. 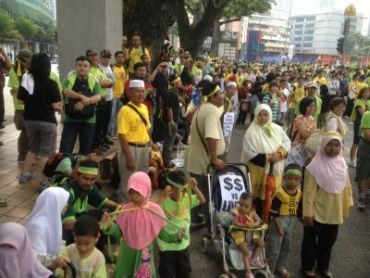 9.05am: Himpunan Hijau members have assembled at the KLCC entrance, Jalan Ampang, with curious onlookers in their midst. 9.06am: A small group of supporters arrive at Central Market with drums, tambourines and placards in tow. Supporters already in the area crowd around the group, appreciating the morning entertainment. 9.09am: A crowd is chanting in front of the police barricade blocking the entrance to Dataran Merdeka at Jalan Raja. Among them are supporters wearing green in support of the anti-Lynas group. Police keep a close eye. 9.15am: Groups of demonstrators begin to sit down in the middle of the Jalan Parlimen-Jalan Raja intersection. A crowd of Bersih supporters seen buying LRT tokens at KL Sentral, some to Central Market, others to Masjid Jamek. Some members of Himpunan Hijau at KLCC pose for pictures with policemen. 9.16am: Police vehicles have been arriving at Sogo since 8am. At least 10 trucks and three buses so far. 9.20am: RapidKL buses are sending passengers to the closest LRT stations (not into the city) as some roads are closed. 9.21am: Police gathered in front of the Bar Council have blocked off the road behind Central Market towards Dataran. Pockets of supporters moving towards their direction and stopping in front of the police. 9.24am: OCBC bank building beside the Masjid Jamek LRT station sealed off to the public with red and white tape. 9.30am: Crowd at Masjid Jamek gathers around a small drum ensemble, singing the song "Stand Up For Your Rights". 9.44am: A crowd at Petaling Street has broken out in protest chants and songs in at least two groups. One group of mothers for Bersih leads boisterous chants in support of Bersih and against Lynas. 9.45am: Police form three lines blocking Lebuh Pudu (in front of the Bar Council office) but allow people to walk to Dataran Merdeka using the path along the shoplots. Policemen at Sogo taking advantage of the calm to have nasi lemak for breakfast. A small crowd gathers about 50m in front of the police barrier at Sogo. Some wearing yellow t-shirts. 9.55am: Increased police presence around the Little India fountain at Brickfields in anticipation of gathering of Bersih 3.0 supporters. No road closure around KL Sentral area. 10am: Very lively and happy crowd at Jalan Sultan. A group is making music with sticks, pails and plastic bottles and marching down the road while others cheer them on. Sogo opens its doors. Still very heavy police presence. Helicopter hovers above. 10.05am: Police are cordoning off Sogo entrances with red and white tape. Only the main entrance is open, with policemen guarding it. The crowd in front of Dataran Merdeka, already sitting, are entertaining each other with "magic tricks." One guy takes a lighter and slides it along his arm but he's not hurt. 10.10am: People are starting to sit down beside the barricade was set up at Jalan Tun Perak to prevent protesters from entering Dataran Merdeka. As they sit, the group is chanting "duduk" (sit). Police still remain stationed behind barricade while Bersih's crowd control personnel present to maintain order amonsgt sit in protestors. 10.15am: A few shops around Sogo opening for business. However, most shops are still closed. The crowd in front of the police barrier here is slowly growing. 10.30am: Growing crowd around Jalan Petaling. Most milling around, some chanting "Bersih". 10.35am: Policemen linking arms at the barricade in front of the crowd at Sogo. 10.36am: Carnival-like atmosphere as a group of Bersih 3.0 supporters with musical instruments spur on a crowd gathered around Jalan Tun Tan Siew Sin and Jalan Tan Cheng Lock. Scores of policemen keeping close watch along with Hospital Kuala Lumpur emergency med services team. 10.35am: Himpunan Hijau and Bersih 3.0 demonstrators at KLCC have started walking, believed to be towards the Australian Embassy. 10.40am: Police are tweeting that eight objects believed to be explosives found outside Menara Dayabumi. 10.43am: A large crowd of people wearing Bersih t-shirts make their way to Jalan Sultan after assembling in front of the Central Market LRT station. 10.45am: Bersih 3.0 organising chairman Datuk S. Ambiga giving a press conference at Central Market. Protestors blocking one side of Jalan Ampang. Several anti-Lynas leaders are giving speeches. Vehicles cannot get through. 10.50am: A small band of supporters wearing yellow seen tying up banners to lamp posts near the Little India fountain, Brickfields. Police are nearby watching. They are chanting "hidup hidup rakyat. Bersih bersih bangkit rakyat." Crowd at Sogo has started chanting slogans. 10.51am: Central Market packed with Bersih supporters now. 10.54am: The crowd assembled in front of Central Market converge at the stage in the parking lot, holding up their hands and making 428 symbols while chanting pro-Bersih slogans with Ambiga and other leaders from the movement. 10.55am: Protesters at KLCC are marching from Jalan Ampang to Jalan P. Ramlee. The crowd has swelled. Main crowd still infront of police barrier at Sogo. Many bypassing barrier by going through Masjid India to reach Dataran Merdeka. Police are not stopping them. 10.57am: More than a thousand have gathered outside the barricade at Jalan Parlimen- Jalan Raja intersection. Crowds are constantly chanting bersih slogans. Police presence has increased as well with cops stationed at the barricade as well as at the Jalan Parlimen roundabout. 11.00am: Himpunan Hijau members prevented from going further up to Jalan Ampang and are proceeing towards Jalan P Ramlee. 11.05am: Supporters crowd the front of the stage at Central Market to snap pictures of Ambiga and other leaders from the movement. A few of them start singing Inilah Barisan Kita. The anti-Lynas group from KLCC is heading towards Jalan Pudu, roads cleared for them. A group of about a hundred students from the Solidariti Mahasiswa Malaysia group has joined the main crowd gathered at the Jalan Parlimen-Jalan Raja intersection. The group came through Jalan Raja Laut chanting Bersih slogans. The crowd is starting to swell here. 11.15am: Crowd greets a group of marchers, led by Selangor speaker Datuk Teng Chang Khim and start chanting Bersih Bersih, as the group marches by Masjid Jamek LRT station. 11.18am: Atmosphere at Central Market calm now as supporters seen going in for lunch. 11.19am: Crowd growing at Little India, in yellow t-shirts and ready to move to Dataran Merdeka. 11.20am: PKR's Azmin Ali seen wearing Bersih t-shirt among the crowd in front of Sogo. 11.22am: More supporters moving into Central Market, coming in from Brickfields and KL Sentral direction. 11.24am: A police helicopter has been hovering above Central Market and nearby assembly points for the last 10 minutes, as protesters go about their business while waiting for further instructions from the movement's leadership. 11.25am: Azmin Ali walking with some through Masjid India to Dataran. Anti-Lynas group to Pudu Central and chanting slogans. 11.26am: A group of Bar Council members are gathered nearby the Little India fountain in Brickfields to observe the situation here. 11.30am: The crowds have started to move towards the Masjid Negara. They were told to do so by PAS' Unit Amal personnel. Meanwhile the crowd gathered at Jalan Parlimen-Jalan Raja waves at a low hovering police helicopter. The group of marchers from Masjid Jamek have stopped at Jalan Tun Perak-Jalan Hang Lekiu intersection and proceeded to sit down and continue chanting. They start singing Negaraku. 11.35am: Little pieces of paper on what to do if arrested are distributed to Bersih supporters. 11.36am: Some Bersih supporters holding up yellow Angry Birds balloons while gathering at Brickfields. 11.40am: Crowd gathers in front of Bar Council, near the barb-wire barricade leading to Dataran Merdeka. Also there are Occupy Dataran protestors who previously camped in the square for the past two weeks. Jalan Sultan crowd is growing; people are chanting Bersih slogans and holding up banners. At least 3 helicopter seen circling the area. Himpunan Hijau members have started a sit-down protest along Jalan Tun Perak, just outside Menara Maybank. 11.45am: Protesters marching from KLCC in green shirts shouting 'Stop Lynas' have merged with the Masjid Jamek crowd at the Jalan Tun Perak-Jalan Hang Lekiu. The Jalan Tun Perak crowd reach Central Market, blocking off the road as they join supporters gathered at Central Market. Their arrival was marked by chants of "Hidup Rakyat!" and "Reformasi!" Crowd getting louder and holding up banners at police barrier near Sogo. Police keeping a close eye. Some of the crowd gather in front of the barricade along Jalan Parlimen-Jalan Raja intersection and watch as about 30 Federal Reserve Unit (FRU) personnel with batons and shields march in the distance toward the barricade. Police say items found outside Dayabumi were not explosives. 11.46am: Big crowd gathers at Jalan Tun Tan Cheng Lock in front of Central Market shouting Bersih chants. 11:50am: Jalan Sultan crowd instructed to move to Dataran Maybank, slowly moving out from Jalan Sultan to Jalan Pudu now. 11.55am: Crowd at Central Market told by rally organisers via loud hailer that they will assemble and do nothing until 2pm, when Bersih 2.0 leaders are expected to decide on their sit-in venue. 12pm: Former Perak MB Datuk Nizar Jamaluddin arrives at Central Market, wearing a yellow Bersih 3.0 collared t-shirt. Bersih supporters who gathered at Brickfields have started moving towards Dataran. Among those in the crowd are Ipoh Barat MP M. Kulasegaran and former Perak Pakatan Rakyat speaker V. Sivakumar. 12.03pm: Shutters of Central Market have come down to keep out protesters gathered in front and around the iconic building. 12.04pm: Bersih supporters causing traffic crawl as the crowd moves from Jalan Tun Sambathan to Dataran Merdeka. Police are controlling the traffic. Users say phone networks are congested and data services are becoming limited in the Masjid Jamek LR area. 12:10pm: Crowd from Jalan Sultan has began walking towards Dataran Merdeka. 12.10pm: A large group walking from the direction of KLCC have joined up with crowd at Sogo. The few shops which were open in the area have closed their shutters in anticipation of trouble. A few leaders of the crowd are trying to negotiate with police. Police retreat. The crowd sits down at the Sogo traffic intersection and continues to chant. 1215pm: Crowd from Little India has joined up with another crowd gathering in front of YMCA in Brickfields. 12.17pm: PAS' Unit Amal is leading the crowd from Brickfields to Dataran merdeka. 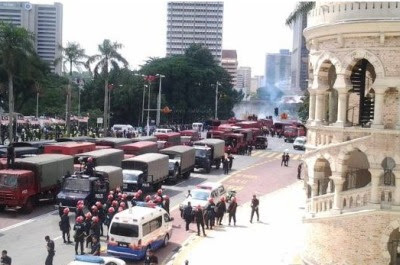 12.18pm: Water cannons spotted along with several FRU buses and trucks along Jalan Raja in front of Dataran Merdeka. Crowd remains seated at the Jalan Parlimen-Jalan Raja intersection. Large crowd seated along the whole of Jalan Tun Perak. 12.28pm: Crowd at Sogo begin marching to Dataran Merdeka through Jalan TAR. Police continue to retreat. 12.35pm: A large crowd marches from Masjid Negara heads towards the road to Dataran Merdeka but stopped by a police blockade. The crowd returns to the mosque area. Opposition leader Datuk Anwar Ibrahim, who arrived earlier, tells crowd they will move towards Dataran Merdeka after Zohor prayers. Former Umno veteran leader Tan Sri Abdul Kadir Sheikh Fadzir and DAP adviser Lim Kit Siang are among those at Masjid Negara. 12.37pm: Two paragliders fly over Central Market. 12.39pm: A detachment of more than a hundred policemen in uniform start to walk towards the Jalan Parlimen roundabout from Jalan Raja Laut. 12.40pm: The crowd from Sogo reaches Jalan Parlimen and merges with the group there. Chants grow louder. Bersih supporters taking their lunch break at a mamak restaurant at KTM station. 12.48pm: Crowd spills over at Central Market as more supporters arrive from Brickfields. 12.50pm: More groups from different locations have made their way to Masjid Jamek. 12.51pm: A police helicopter hovers low over Central Market, as hundreds more protesters stream in to the area. It momentarily drowns out protesters' chants then moves on. Organisers tell crowd not to cause any provocation during the rally. 12.51pm: A group of FRU personnel gathered at the Jalan Parlimen roundabout have rung their warning bell. A group of demonstraters are standing their ground. 1pm: Massive crowd at Masjid Jamek, now that the groups from Jalan Sultan and Himpunan Hijau group have arrived. Street is jampacked with human beings. DAP national chairman Karpal Singh has arrived at Central Market. Police have sounded a second warning bell, warning the crowd around Dataran Merdeka. The demonstrators remain defiant. 1:15pm: Crowd from Jalan Sultan has flowed into Jalan Tun H.S. Lee, road is filled with people walking slowly and peacefully chanting slogans from time to time. 1.15pm: Two police black Marias that have been stationed near the Masjib Jamek LRT station all morning have moved towards Dataran Merdeka. 1.19pm: Thousands of rally participants stop their chants of 'Bersih' and 'Stop Lynas' as Zohor prayers heard from Masjid Jamek. 1.20pm: FRU personnel have re-grouped at Dataran Merdeka. Water canon trucks also on standby there. Muslims protestors gathered at Masjid Negara enter mosque to perform prayers. 1.23pm: Protesters at Dataran throw plastic bottles at police trucks passing by, heading to Jalan Parlimen roundabout. 1.30pm: Bersih 3.0 chairman S. Ambiga tells crowd at Central Market that march to Dataran Merdeka will begin at 1.45pm; crowd from Masjid Negara to march after Zohor prayers. Ambiga says they will not breach the barricade, will march as far as the authorities will allow, and proceed with their sit-in protest wherever they stop. Jalan Sultan crowd has reached and stopped at Bar Council building area chanting Bersih slogans here, chanting "buka pintu". They are from moving any further by the police. Some Muslim supporters at Masjid Jamek perform prayers outside the mosque's front yard. 1.45pm: Protesters begin their march from Central Market to Dataran Merdeka. They are led by Ambiga and other Bersih and Pakatan leaders. Protesters sit down in front of the police block at Jalan Lebuh Pasar Besar, next to Bar Council building, still singing and chanting Bersih slogans. 1.56pm: Opposition leaders Tony Pua and Nurul Izzah Anwar have joined the rally at Masjid Jamek, together with some of the Bersih steering committee members. 1.59pm: PKR's Nurul Izzah is addressing the Masjid Jamek crowd. 2pm: Protesters from Central Market, led by Ambiga, join up with protesters assembled near Masjid Jamek, the closest they can get to Dataran Merdeka. The crowd at Masjid Negara has started march towards Dataran Merdeka via Pasar Seni. Crowd is led by Opposition leaders. 2.04pm: PKR deputy president Azmin Ali addresses crowd sitting in front of Dataran. He asks, "Do you want to enter Dataran?" Crowd shouts back yes. Azmin says "Dataran does not belong to DBKL"
2.20pm: Barbwire barricade at Jalan Raja Laut forcibly removed by protesters, despite Bar Council urging them to stand down. A DAP advises crowd to remain seated at same location in front of the police block at Jalan Lebuh Pasar Besar, next to Bar Council building, until 4pm - "If you enter Dataran, no law will protect you. Our advice is, remain seated here. Do not try to enter Dataran"
Crowd at Masjid Jamek observe a minute's silence in remembrance of Anuar Baharuddin, who passed away at the last Bersih rally. They then sing Negaraku. 2.25: Crowd at Dataran chanting, "We want Dataran" and trying to push through barrier now. Fears of stampede for people on the front now but situation brought under control again. Situation very tense. Earlier, police doubled the number of FRU personnel and vehicles and Water cannons have doubled. However, FRU have not budged from their location in front of Dataran Merdeka. 2.30pm: Ambiga tells crowd at Masjid Jamek to disperse, after a short speech where she reiterated her call for free and fair elections. 2.40pm: Truck that Ambiga, Anwar and the rest were standing atop slowly heads in the direction of Dataran while the crowd follows. 2.57pm: A group of demonstraters break through the barricade at Dataran. Police forced to fire tear gas and spray water cannons at the protesters. 3pm: Protesters who breached barricades fleeing from police personnel. Several protesters arrested. More tear gas fired to disperse protesters, who are now fleeing towards Jln Tuanku Abdul Rahman. 3.05pm: FRU personnel have moved into the areas surrounding Dataran Merdeka. 3.15pm: RapidKL: Masjid Jamek LRT station closed; passengers heading to the station need to alight at Pasar Seni or Dang Wangi. More tear gas fired to disperse protesters, including at Jalan Tun H.S. Lee and near Masjid Jamek LRT station. 3.45pm: RapidKL: Dang Wangi and Pasar Seni LRT stations closed. 3.55pm: Some protesters gathering at Pasar LRT station to avoid tear gas. Crowd also moving towards Brickfields. 4.00pm: Protesters siting along sidewalk from Sogo to Maju Junction. 4.00pm: Tear gas fired again at Jalan Pudu in front of Kota Raya. Protesters running towards Pasar Seni. 4.10pm: Malaysian Red Crescent volunteers handing out water to the crowd in front of Sogo. 4.13pm: Dataran Merdeka quiet now as protesters have been dispersed. No more tear gas fired. 4.20pm: At Masjid Jamek, protesters have still not dispersed. Police are now firing water cannons. Those not affected by water still staying put. 4.28pm: Several police jeeps parked outside Maju junction take off in a hurry as protesters kick and throw water bottles at them. 4.32pm: RapidKL: LRT stations at Plaza Rakyat, Bandaraya, Masjid Jamek and Pasar Seni still closed. Dang Wangi is opened. 4.50pm: Crowds seen dispersing and leaving Dataran. 5.10pm: FRU gathering at Jalan Tun Tan Cheng Lock and Jalan Tun H.S Lee to disperse crowd. 5.15pm: Several protesters taunt FRU at Tune Hotel near Jalan Sultan Ismail. FRU retreats to Maju junction. Heavy traffic there due to protesters on the street. 5.20pm: Police leave Masjid Jamek. Protesters remain. 5.35pm: RapidKL: Sulatan Ismail LRT station reopened. Bandaraya, Masjid Jamek and Plaza Rakyat stations remain closed. 5.40pm: Home Minister Datuk Seri Hishammuddin Tun Hussein tweeted that two policemen had been injured and admitted into hospital. The snatched police pistol has been recovered. So far, 23 received outpatient treatment, including 20 policemen and three protesters, he said on his Twitter posting. 5.42pm: Ambiga said Bersih did not support the act of certain individuals who broke the barrier at Dataran Merdeka. She urged the police to investigate the incident that caused police to fire tear gas into crowd. 6.10pm: Opposition leaders tweet to urge protesters to disperse. 6.20pm: Protesters at Masjid Jamek hurl things at passing police cars. Some car windows broken. 6.25pm: Riot police and water cannon trucks that had left Masjid Jamek earlier return to disperse defiant crowd there. 6.45pm: An unidentified person threw a rock and smashed the window of a four-wheel vehicle with Special Action Force in it, near Jalan Parlimen roundabout. 8.30pm: Police say that by 8pm, 388 people had been arrested. After the protesters had gone home, there was still a strong police presence remaining at Dataran Merdeka. Earlier protesters breached a barbed wire cordon, triggering a response from the police that included water cannons and tear gas. Police said their response was prompted by the violent act of protesters, and by 8pm, 388 protesters had been arrested. Although the rally and the sit-in to demand free and fair elections was to have been held between 2pm to 4pm, people began gathering in the morning and dispersed well after nightfall. Protests were more peaceful in other parts of the country including Penang, Kuantan, Malacca, Johor Bahru and Kota Kinabalu, Sibu, Kuching in East Malaysia. Malaysians in other cities like Osaka, Melbourne, Hong Kong, Shanghai, Paris, London and Taipei also gathered to show their support for Bersih. Selected videos to follow. Stay tuned.. 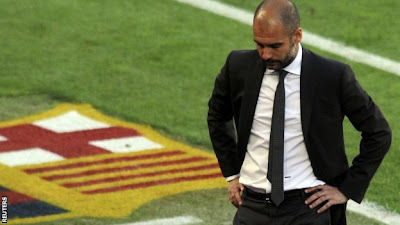 Pep Guardiola, Barcelona Coach To Step Down.. Pep Guardiola will stand down as Barcelona manager at the end of the season after deciding not to renew his rolling one-year contract. The 41-year-old, who was appointed in 2008 and has led the Catalan club to 13 trophies, will be succeeded by current assistant Tito Vilanova. Barca look set to miss out to Real Madrid in La Liga and were knocked out of the Champions League by Chelsea. "The reason is simple: four years is enough," said Guardiola. Dataran Merdeka is off-limits but hats are not.. 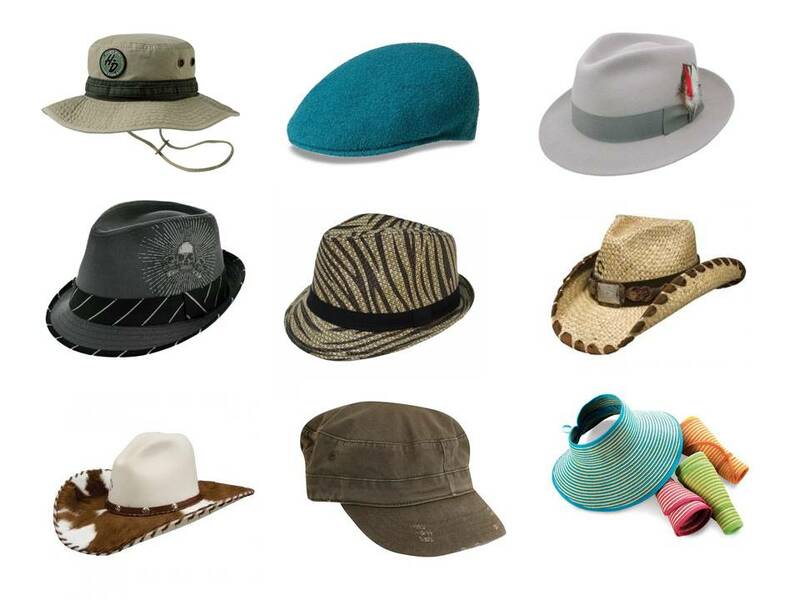 Hats are not popular here in Malaysia when they ought to be in this tropical climate. The weather the past few days has been hot and dry and humid at the same time. The strange thing about our weather is, when it rains it pours and when it's dry, it can get really, really hot. By the way, if you intend to be at the Bersih 3.0 rally tommorow, it would be wise to bring along a hat or an umbrella or both - to protect yourself from the sun, to fan yourself with, or to shield yourself from any shower, if you get what I mean. 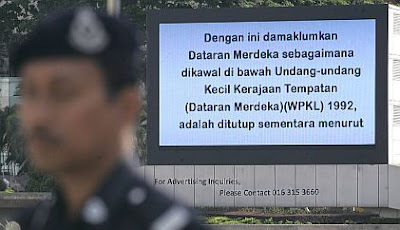 Doesn't this look like the giant tv at Dataran Merdeka, and with a message too that says the square is offlimits. This is Dataran Merdeka, quiet and deserted after KL Mayor, Tan Sri Ahmad Fuad Ismail, declated Dataran Merdeka and all roads leading to it would be closed from 6am Friday to 6am on Sunday. Meanwhile the Magistrates court has issued an order preventing the organisers of Bersih 3.0 and members of the public from entering Dataran Merdeka on Saturday. The order was made at 8:30pm Thursday by Magistrate Zaki Asyraf Zubir following an application by the police. The court order bars organisers and members of the public from gathering at Dataran from midnight Friday until May 1. From what I read, the venue for Bersih 3.0 is Dataran Merdeka. There will also be a Bersih rally in Ipoh, at the Sultan Abdul Aziz Recreational Park, popularly known as the Polo Ground. The Bersih movement is for free and fair elections in the country. Flashback to last rally, last year..
Tacos, a food with Mexican origin, has not caught on here yet, but lately, crepe stalls have been springing up in shopping complexes in the city operating as a food chain manned by foreigners mostly. This week's quiz is called The Taco Test and which says I am Hilarious. My rating of the results? I'd say 4 is pretty close. Have a nice day ahead and a wonderful weekend, everyone! You are light hearted and fun loving. You look forward to each new day. You are a bit offbeat and quirky. You enjoy the unexpected things in life. You are a person of complex taste. You like how different elements go together. No one would describe you as boring. You have a fresh and interesting outlook. 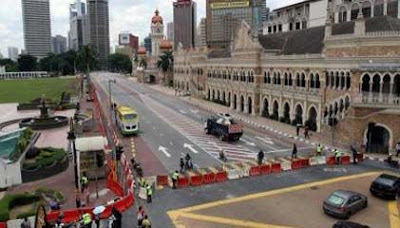 Dataran Merdeka has been cordoned off and all roads leading to it would be closed from 6am today to 6am on Sunday. 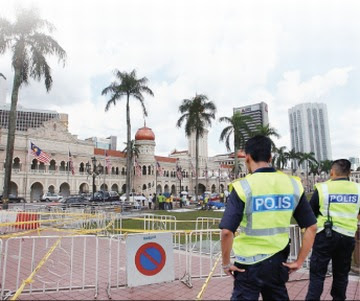 KL mayor Tan Sri Ahmad Fuad Ismail said no gathering would be allowed at the square without his written consent. This is voiced in relation to the Bersih 3.0 rally scheduled for Saturday, Apr 28, which Dataran Merdeka as the venue is not being approved. Alternative venues offered include Cheras Stadium, Titiwangsa Stadium, Bukit Jalil Stadium and Stadium Merdeka. If you had put your money on Barca and Madrid playing in the Champions League final, you would have lost it. So, it's Chelsea FC and Bayern Munich through to the Champions League final to be played at the Allianz Arena. 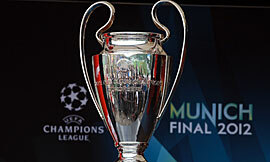 Meanwhile the Champions League trophy has arrived in Munich, the Allianz Arena being the venue of the finals on May 19. Both the UEFA Champions League and UEFA Women’s Champions League trophies were placed in the city authorities’ care in the ceremony at the historic Old Town Hall on Marienplatz at 4 pm. 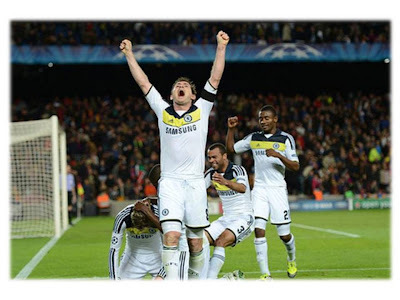 Who are you rooting for to win the 2012 UEFA Champions League crown? Chelsea FC or Bayern Munich FC? A colleague recently moved into her new home, a corner lot with a big garden. She bought it second-hand. No renovation needed as it has all the necessary cabinets and stuff in place. 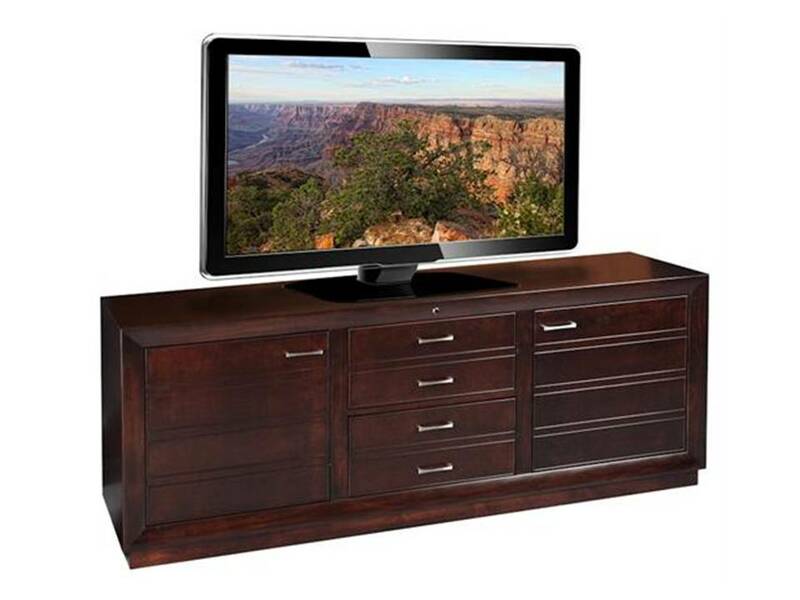 Nothing major needs replacing except for a few minor things including the tv stand. She prefers one made of solid wood. She is now checking out tv stands around town as well as online. So far, she thinks there are a lot more choices online, including colours and shades. I'm sure she'll find one in time for her house-warming party. 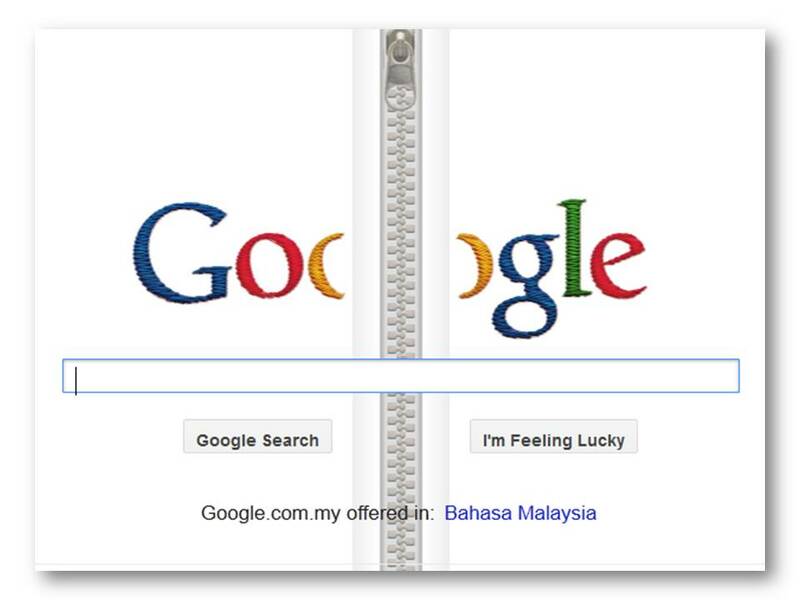 Today, Google celebrates Gideon Sundback's birthday with a Google doodle, an interactive giant zipper running down the search engine's homepage commemorating the birth of the zip's inventor. Born on April 24, 1880, the Swedish-American electrical engineer is most commonly associated with his work in the development of the zipper that revolutionized the clothing industry. 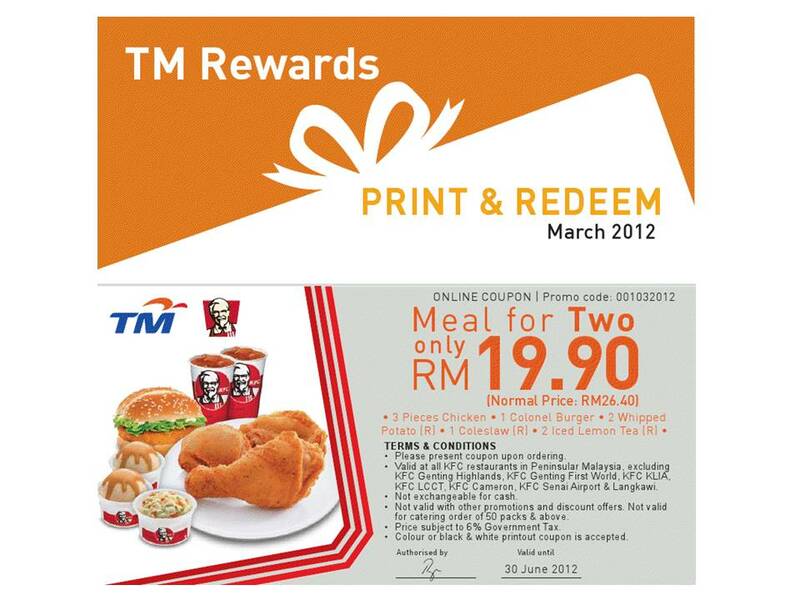 KFC Voucher - "Meal for Two"
McDonald's hasn't given out any vouchers lately but here is a KFC voucher for you. 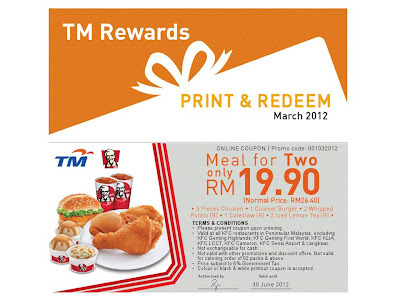 Though it's not for a free meal, the voucher offers a discount on a KFC "Meal for Two". Just print out the coupon above and redeem. Black-and-white vouchers are also accepted. Voucher is for a Meal for Two at RM19.90, normal price at RM26.40. 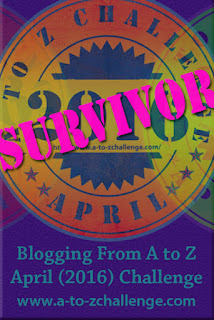 I noticed lately there has been quite a lot of hits on my site looking for The Biggest Loser. 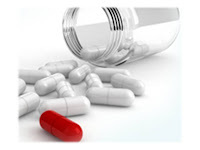 If they are looking for tips on losing weight or interested in starting a weight loss regimen but at the same time worried about the safety of diet pills, there are a lot of sites online with advice on diet pill side effects and reviews on diet pills as well as as tips on types of food to eat, etc. We all know that there is no one diet pill that fits all. So, it is important to shop around and do adequate research before the big step is taken. Remember that health is important. Best wishes..
Friday Frolics -What Color Purple Are You? The color purple. Some people love it, some just hate it. royalty, imperialism, nobility, Lent, Easter, Mardi Gras, episcopacy, upper class, poison, friendship, engineering, passion, sharing, wisdom, rage, homosexuality, contrition, sympathy, extreme and sophistication. If you'd like to know more about each of these, 'wikipedia' it. If you were purple, what shade of purple do you think you are? Take the quiz to find out. I'd rate the result of this quiz as 4.5. Ahh...One happy family - The Brangelina brood comprising parents Angelina Jolie and Brat Pitt, the twins, Vivienne and Knox, Shiloh (three biological children), and three adopted children, Maddox (oldest child at 10) from Cambodia, Pax from Vietnam and Zahara from Ethiopia. It has been reported that the family will be moving to the UK for two years. Here's a peek at the sparkler, Angelina Jolie's engagement ring. 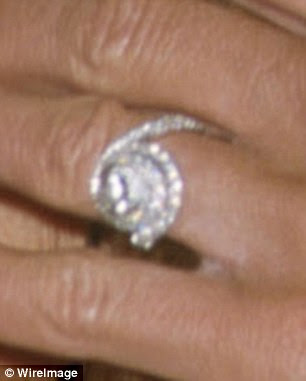 The engagement ring was designed by Robert Procop, a private jeweller for the couple, in collaboration with Brad Pitt. Procop said: 'Brad had a specific vision for this ring, which he realised over a yearlong collaboration. He wanted every aspect of it to be perfect, so I was able to locate a diamond of the finest quality and cut it to an exact custom size and shape to suite Angelina's hand. Back in 1999, Brad gave Jennifer Aniston a diamond and platinum engagement ring. The actor is believed to have co-designed it with jeweler Silvia Damiani, with an estimated value of $500,000. The couple divorced in 2005. 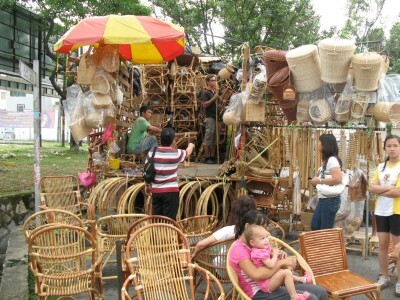 I have seen cane and rattan furniture being done, personally created with care by the artisans (yes, I call it an artform). Each piece of these furniture is really a work of art, from a simple rattan stool to a cane furniture living room set, and everything in-between. Unfortunately, the trade of making cane and rattan furniture is disappearing fast as making cane and rattan furniture is a time-consuming and laborious process. Nowadays, mass produced furniture has taken over. 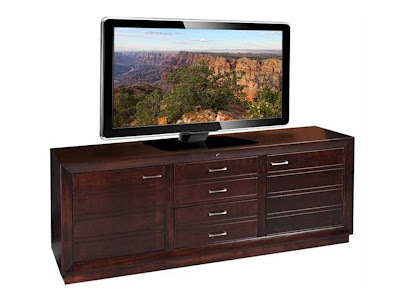 Looking for cane or rattan furniture or products? If you are in Kuala Lumpur or in the Klang Valley, here is where you can find some readily available, probably cheaper cane and rattan furniture. Is Your online Income from Overseas taxable? The period of filing in Income Tax returns is here again. In recent years, the IRB has been engaging with the public providing good feedback answering taxpayer queries on what can and cannot be claimed. I came across an item in the Q&A on The Star today which may clear a doubt for Malaysian bloggers who are making money online, i.e., income from overseas. Let me know if I'm understanding it incorrectly. Q: I have a full-time job but I also do some overseas stock option investment and I was wondering if the gain is taxable. If the gain is taxable, how about the losses? IRB: With effect from the year of assessment 2004, income received in Malaysia from outside Malaysia is exempted from tax. Hence, an individual is taxable only on income accruing in or derived from Malaysia. There is more where the above came from. You can check out answers to taxpayer queries that may apply to you, e.g., purchase of sports equipment, education and medical insurance, etc. - Tax rebate for those who pay zakat (tax calculation included). The Star highlighted a talented artist from Sabah who has been invited to speak at a conference in the United States. She will be among the 60 invited speakers at a e.g. Conference. Twenty-six-year-old Hong Yi, an architect by day and an artist by night, is one of the two Malaysian speakers at the three-day e.g. Conference in Monterey, California, which started yesterday. The other Malaysian to speak at the event is Ren Ng, founder and chief executive officer of California-based start-up company Lytro that develops consumer light-field cameras. After the Yao Ming caricature, she used coffee cup stains from about 20 cups of coffee to produce an image of Taiwanese singer Jay Chou. 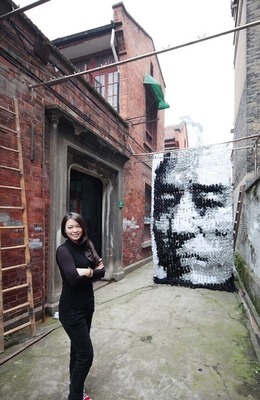 The Zhang YiMou protrait in the image above is made from socks, pins and bamboo sticks. Below are the videos showing her working on the three portraits. Interesting and very talented! Expect an exhibition of her works when she has enough of them to put up. I look forward to it. How nice, it's Friday again! And another round of Friday Frolics. I'd rate this at 5 = Close to 100% true. You truly enjoy life, and you like to take time to savor it. You are service-oriented and generous. You find meaning in giving back. At your core, you are individualistic. You are most comfortable flying solo. This is breaking news on CNN this morning. Defying warnings from the international community, North Korea launched a long-range rocket on Friday, but it appears to have broken apart before escaping the earth's atmosphere, officials said. The launch occurred at 7:39 a.m. Friday. Nowadays, people plan better for holidays or at least they know exactly what they want with regard to going on a holiday. We were talking about holidays at breakfast last week and the choice between free-and-easy option versus a guided tour. Most of us prefer to go on a guided tour, me included. The thinking is when we go on a holiday, it is supposed to be enjoyable and not having to run around (albeit on the Internet) searching for the best travel packages, itineraries, hotel and transportation reservations and the like. Most of us at breakfast agreed that free-and-easy is preferred when there is a friend or friends in the holiday destination familiar with the place. On a free-and-easy vacation, vacation homes do work well as they are something like a home away from home. 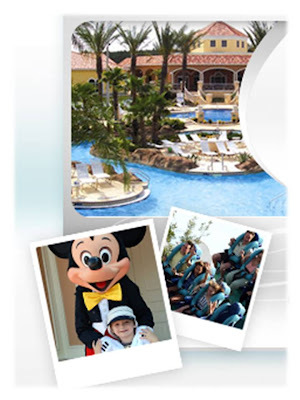 I came across some Vacation homes in Kissimmee, Florida, online recently and thought they would make great accommodations on a trip to Disneyland. Staying in a vacation home would allow for more flexibility in schedules and could significantly reduce the holiday expenditure. What about you? Would you prefer to stay in a vacation home instead of a hotel room? According to The Star, a massive 8.7 earthquake (preliminary magnitude of 8.9) struck waters off westernmost Aceh province in Sumatra, Indonesia, triggering a tsunami alert in countries across the Indian Ocean. The quake was centred at 33km beneath the ocean floor, around 434km from the provincial capital of Banda Aceh. In Penang, mild tremors lasting about a minute were felt in Seberang Prai around 4.45pm, sending people scurrying out of their homes and public places. Tremors were also felt in the Klang Valley and Perak, all along the west coast of Peninsula Malaysia. In Bangkok, a tsunami warning and evacuation order were issued by disaster prevention authorities in the southern Thai provinces of Phuket and Phangnga. Warning sirens have been turned on and people have been asked people to move to a safe place. A giant 9.1-magnitude quake off Aceh on Dec 26, 2004, triggered a tsunami in the Indian Ocean that killed 230,000 people, nearly three quarter of them in Aceh. The Indonesian archipelago is located in the Pacific Ring of Fire, an area where large numbers of earthquakes and volcanic eruptions occur in the basin of the Pacific Ocean. 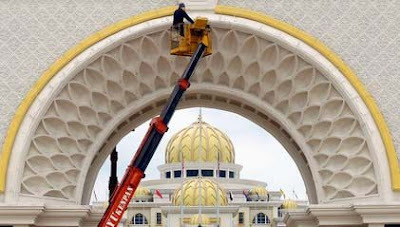 After recording the installation of the 13th Yang di-Pertuan Agong, Tuanku Mizan Zainal Abidin, in 2007, National Geographic will once again be recording the installation of Malaysia's new King, the 14th Yang di-Pertuan Agong, on Wednesday, 11 April 2012. This is a unique installation of Tuanku Abdul Halim Mu'adzam Shah as the King for the second time. This is the first time that a Sultan or Ruler has been re-elected as the Head of State since Malaysia gained independence in 1957. Tuanku Abdul Halim, who was proclaimed the fifth Yang di-Pertuan Agong in 1970 when he was 42, has been elected to be the 14th King at the age of 84. He is the first ruler to hold the position twice, as well as the oldest elected to the office. His reign began on 13 December 2011 after his election by the Conference of Rulers. During His Majesty's reign as the fifth Yang di-Pertuan Agong, the prime minister at that time was Tun Abdul Razak and this time, Abdul Razak's son, Datuk Seri Najib, is the head of government. Filming, in collaboration with Finas, began in December during the taking of the oath and signing of the instrument of office by Tuanku Abdul Halim in Balairong Seri, Istana Negara, Jalan Duta. The documentary will also showcase the new palace, Istana Negara. In conjunction with the installation of the new King, it has been announced that 11 April 2012 will be a national public holiday for all states and territories of Malaysia. Update (11 Apr) - Malaysian tv station TV1 carried a live telecast of the installation of the new King. Malaysians eat out a lot, the author included, and it is always nice to see a new eatery in an area you often frequent. Recently, I spotted a new food outlet in the neighbourhood. A lovely blue outdoor umbrella among the row of outdoor umbrellas caught my eye. Unlike most eateries, this new food outlet emphasises on color as evidenced by the umbrellas out in the sun that come in various colors complemented by the equally colorful but matching tables and chairs. From the outside, the place looks really inviting. Will have to give it a try soon.. I should have posted this earlier but if you are a fan of Manchester United Football Club and/or a fan of the Great Dane, the club's former goalkeeping great Peter Schmeichel, plus you have a free afternoon today, you may want to pop over to the branch of Courts Malaysia at Setapak, Jalan Genting Klang. 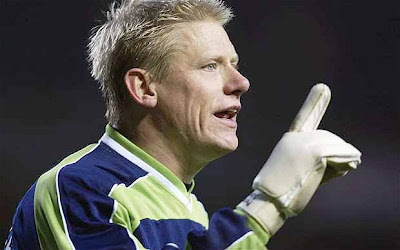 Peter Schmeichel will be there today for his inaugural tour as the official ambassador for Courts Malaysia, the country’s largest consumer electronics and furniture retailer. Courts recently announced the appointment of Schmeichel as their new ambassador. In conjunction with Schmeichel’s visit here, Courts is arranging a meet-and-greet and autograph session with the player at their Setapak outlet planned for today from 2pm. Spend RM50 at the store to obtain the exclusive meet-and-greet pass for an up-close-and-personal photograph and autograph session with the Great Dane. Friday Frolics - What Stone Cut Are You? Let's do a stone-cut Friday Frolics personality quiz this week. Interesting questions too. Take the quiz to find out what stone-cut you are. Oh dear, it says I am a maverick! You provide direction and leadership for others. People are looking to you to see what you'll do. You are ready to fight for your interests. In the end, you need to take care of yourself first. You are a maverick. You've always been unconventional and an individualist. You refuse to conform. You are both an ambitious and aggressive person. Right now, your professional life comes first. I learned a new term today from The Star. The term is cina buta literally translates to blind Chinese. There must be a logical or justifiable explanation to the origin of this term, I am sure. Read on for its meaning, in the meantime. >THE term cina buta is synonymous with a situation where a Muslim man who has filed an irrevocable divorce (talak tiga) against his wife is intent, for whatever reason, to marry her again. The divorced woman can take another candidate as a husband but if the next marriage also ends up in a divorce, she is considered an eligible single woman and, under Islamic law, her first husband can seek her hand in marriage. Using this technicality, Harian Metro reported that some ex-husbands were willing to pay another man to become the cina buta so that it would be legal for the first husband to reconcile with her. “I have been offered three times to be a cina buta,” said 31-year-old Ramli, who boasted he was paid up to RM10,000 each time. He is among a group of men who offer their services through the Internet to desperate husbands who had divorced thier wives on talak tiga and sought to marry them again. When you have a melting pot of ethnicities and cultures as in Malaysia, words tend to cross borders and get adopted along the way. That is the beauty and fluidity of languages. Everything evolves, why shouldn't languages? 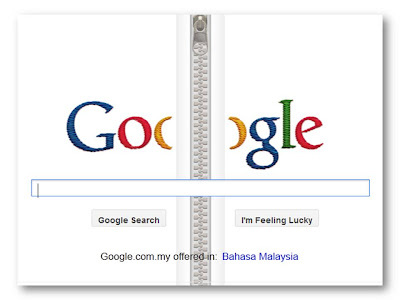 By the way, a Google search on cina buta yields more than 2.7million results! I have relatives living on the outskirts of the city who still have a well in the backyard. Even though there is running water, well water is used for watering the plants and for washing. Well water comes in really handy when taps run dry due to water rationing when reservoir level drops from insufficient rainfall or when piping works are in progress. It's nice to visit with them because of the rustic feel of the place with fowl running everywhere and fruit trees out back. Charming rustic lighting and furniture give one a welcoming feeling. The price of the premium RON97 petrol went up 10sen to RM2.90 at midnight last night, Monday, according to the Petrol Dealers Association of Malaysia (PDAM). There is no change for RON95 petrol, still at RM1.90 a litre. The price for diesel also remains unchanged at RM1.80 a litre. The price increase is due to the soaring global fuel price that has hit USD120 per barrel. The price of RON97 fluctuates in accordance with the global fuel price as the Government has lifted subsidy for this petrol. There have been four increases in RON97 petrol price since the beginning of 2011. The last increase on May 5 (2011) saw a hike of 20 sen to RM2.90 per litre. On June 15 midnight, the price was reduced by 10 sen to RM2.80 per litre. That was the first reduction since the price was floated at market rates. Gift-shopping is not an easy task, I tell you. Two birthdays just around the corner, so I had to go looking for two presents - one for a little boy and the other for a little girl. Spent some time at the shopping mall checking out toys, books, clothes, girly knick-knacks, stationery and so forth. Even thought about gift certificates but little juniors don't appreciate that so on to more tangible stuff. 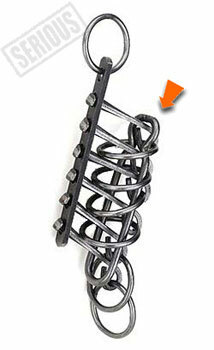 Puzzles could also make great gifts, especially those that last, such as metal puzzles but these would be more for older children, I guess. 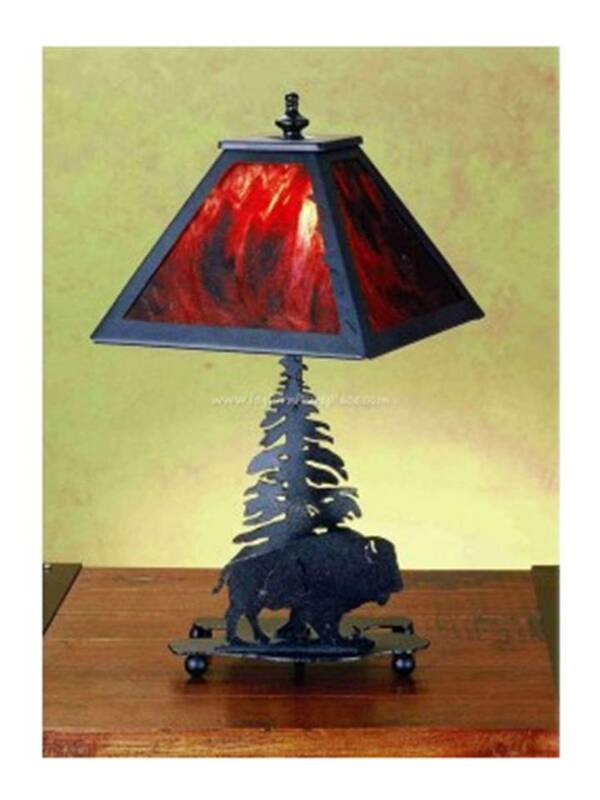 Still, a good gift idea to keep in view. Two days ago when I read about the bombing incidents in Yala in southern Thailand, I was thinking luckily it wasn't in Haadyai. Still, it was a terrible thing to be happening when such terrorist acts result in injuries and loss of lives. Eight people died and at least 70 were injured in a series of bomb explosions on Saturday. Three bombs went off in the business area of the city of Yala around lunchtime. It was reported that the devices may have been placed in a car and a motorcycle. Haadyai or sometimes spelt Hatyai is a tourist destination popular with Malaysians. Busloads of Malaysians descend upon the tourist town of Hatyai, especially during weekends. 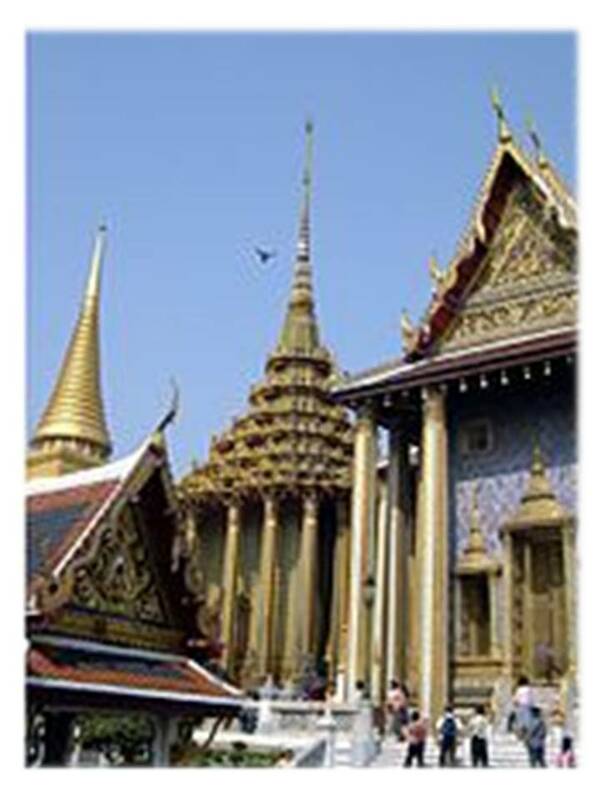 People go there for a short holiday to have a chance to visit a foreign land, for a spot of shopping and some cheap and authentic Thai food. The more adventurous would have a chance at their agenda however. Haadyai is merely 30km away from the Malaysian border and only a two-hour drive from Penang. From Kuala Lumpur, buses leave around ten at night and reach there in the morning. A weekend trip would entail leaving Kuala Lumpur on Friday night, arriving at Haadyai Saturday morning. A trip to the seaside town of Songkla is sometimes included. Some sightseeing, shopping and a Thai seafood dinner will complete the short sojourn to Thailand. After Sunday morning after breakfast will see everyone getting back into the coach heading back to Kuala Lumpur arriving around nine at night. 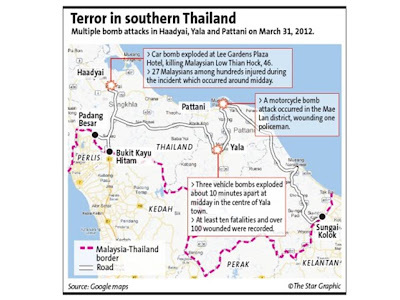 Unfortunately, Haadyai was not spared in the spate of bombings in the southern Thailand recently. 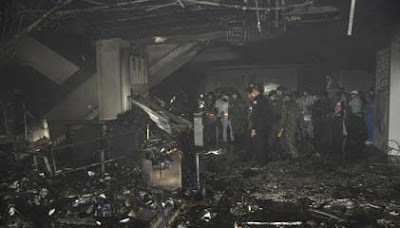 On March 31, 2012, a car bomb shook the 33-storey, 405-room Lee Gardens Plaza Hotel, (the hotel popular with Malaysian and Singaporean visitors), killing four people injuring a hundred others, some critically. A Malaysian from Kuala Kedah is now listed as missing in the bomb blasts. Haadyai Mayor Prai Pattano clarified that two car bombs in the basement car park were used in the attack and not one as reported earlier. Lee Gardens Plaza Hotel is along the busy Phachaitipat Road. There is also a McDonald's restaurant on the hotel's ground floor that is popular with tourists. The hotel is also within walking distance to the often busy Suntisuk Market. A press release handed out by a Thai official stated that 416 people (at least 27 Malaysians) were injured in the blast at the hotel, of whom 37 were admitted to hospitals; three people died in the blast - a Malaysian man and two Thai women. There is an unidentified body of a man lying unclaimed at the Songkhlanagarind Hospital. The Muslim insurgents have been blamed for the deadly coordinated attacks. Menanwhile, Malaysians are taking no chances, with many postponing or cancelling their planned holiday trips to Haadyai following the blasts at the Lee Gardens Plaza Hotel. Foreign Minister Datuk Seri Anifah Aman advised Malaysians against travelling to southern Thailand and that those who intend to visit the area should only do so if it concerns urgent matters and they should inform the Malaysian consulate in Songkhla. Thailand will be celebrating Songkran (Thai New Year also known as the Water Festival) on April 13. A colleague and two of her friends just came back from a trip to Bangkok. Everyone knows Bangkok is the place for shopping. So as expected they all came home with having to pay for excess baggage. She said it is still worth it. Besides clothes, accessories, and handicraft, she also brought home some seriously nice discount upholstery fabric. They are silk fabrics and come in very attractive patterns and shades. 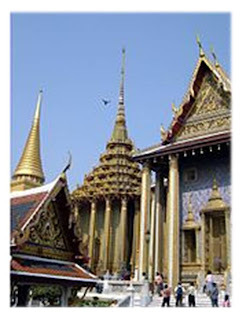 A reminder, if you are planning to shop, I mean really shop, in Bangkok, the places to go to are factory outlets. But seriously with all those bomb incidents lately, they must be very brave to be venturing into Bangkok. The lure of shopping overcomes all fears, I suppose.